The characters of Numenera are varied and intriguing - and there are so many options! Even after you choose to be a glaive, will you be a Charming glaive who Leads, a Learned glaive who Wields Two Weapons at Once, or a Graceful glaive who Rides the Lightning? Create characters, explore the setting, and learn the basic rules in this inexpensive player's alternative to the Numenera core book. It's perfect for getting a taste of the game, having an extra rules and setting reference on hand at the gaming table, or for game masters to hand to new players. 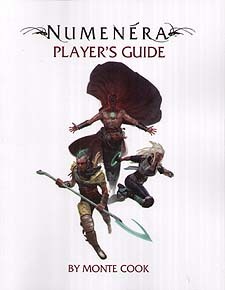 The Payer's Guide is a fantastic, ready resource for anyone playing Numenera, and a wonderful introduction and teaching tool for the game.